Do you punish them for being children? | HOLY TANGO! The little boys father was washing his beloved car and left it unattended for a short while. On his return he saw his son scratching it with with a stone. The son’s dad was so cross he smashed the son’s hand in the car door. The son lost the use of his hand. It was only much later when he(the father) was standing back when he saw what the little boy was scratching on the car. A couple of years ago in the “romantic” town of Darling my children – yes all 3 of them – was up to no good in the small village where we lived. They decided to send this warning letter to the neighbors. Well, you have to understand the events before this prank to understand why children stay children. I am fascinated by cemetries and we all went for a guided tour to read the epitaphs on the tombstones. Some were children who died young. Others were old folk who moved on. We went home and planned a “ghost walk” throught the town. It was somewhere in winter and night fell quickly. We stolled through the streets and saw old folk from the street. An old lady rocking in a chair in the old “koshuis”. Bats flying around and only visible when crossing the street lights. It was exciting. Arriving back home we lit the fireplace and enjoyed family company. After a full day of spooky events their imagination were as active as any childs would be. 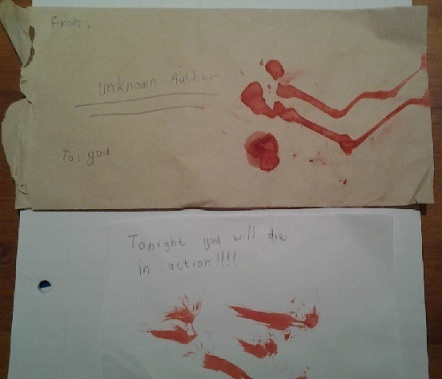 They wrote these letters and to our dismay went to mail them to a couple of neighbors. The next morning all the immediate neighbors were up in arms and only one lady – Helga – came t inquire about it. I repremanded them and thought it was all in the past. Some time later I was in the proses of buying a local property business and the seller said she is concidering not to sell the business to me. After lifting my eyebrows she explained people in the small town dislike me for what my children did. Aparently some time before our “ghost walk” a local lady was murdered which left everyone up in arms. It wasn’t untill I joined a local security group that I was made aware of the police searching for the “writer of the letter/s”.